Since the temperatures have dropped in St. Louis we have to put really warm sleepers on Andrew. Along with the sleeper we put a blanket on him. Look how cute he is after his food and bath and ready for bed! So Matt and I applied for a scholarship to the YMCA about two weeks ago. I was really hoping for this 1. So i can start working out and lose the rest of my baby weight and 2. So i could get a break from my baby and some time to myself. Don't get me wrong, I LOVE being a mom and it is a blessing that I get to stay home with Andrew, BUT a break is nice every now and then. Well today I got that break! I worked out and showered all by myself! It was great! I ran on the treadmill, went on the bike and did some of the weight machines for my back (it has been really sore since Andrew has been born). THEN, i took a shower without having to worry if my baby is going to fall off the bed or lay there and cry for 5 minutes! Praise the Lord for the YMCA and what a blessing this scholarship is! I picked Andrew up just short of 2 hours and he did great. He took a little nap and one of the nursery workers commented on what a happy baby he is! SUCCESS! Matt and I started dating 10 years ago today. Yes, we are the couple that dated in high school and got married and are still together today. I can remember the time Matt 'asked me out'. We were at my Dad's house, it was late, and we were sitting on the couch and we had just finished watching a movie (a really long and boring movie- A Walk in the Clouds I think). Anyway, he was getting ready to go and he leaned over and very nervous said something like, "So do you um want to um go out with me um." I was VERY excited (17 and thinking this was the best day of my life), I said "YES". It is history from there. Here we are 10 years later, married with one child, living in our second house, both graduated from college, Matt getting his Masters, loving and living life! Happy 10 year 'fake' anniversary, honey! I love you and look forward to many, many more years with you! 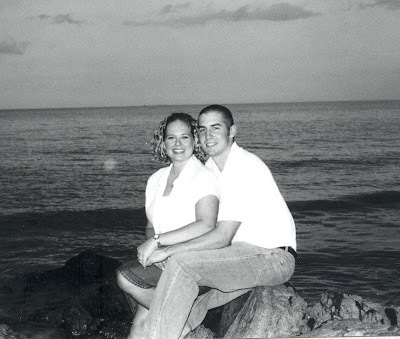 This is one of our engagement pictures, I did not have any pictures scanned in from our high school days! Matt has class on Tuesday nights and does not get home until around 9:00. This leaves me home with Andrew all day and all night by myself. Beause of this Matt has been taking Andrew for a few hours on Tuesday mornings so I can have time by myself. This is such a relaxing time for me. Today I was able to run to the grocery store, run some other earrands and come home color my hair and shower without any worries. Thank you for my Tuesday breaks honey. I appreciate all you do for Andrew and me! Last week when my Mom and Sister were in town the three of us went out for a Girl's Night. We went to Bar Louie and had dinner and drinks (If you have never been to Bar Louie-GO! They have great food and drinks). It is Trivial night at Bar Louie on Sunday's so we played and won! We got $25.00 off our tab. Having my mom with us was a big plus, she is the queen of trivia. We had a great time together! Liza and her fancy drink! I love this picture of me and my mom- we just look really happy! We went to the St. Louis Zoo yesterday. We were there during Andrew's afternoon nap and he was SO good. He took a little cat-nap and handled the 3 hour zoo trip great! We pretty much made it through the whole zoo. It was a lot of fun!